A gorgeous sunny day on Moosilauke, with an undercast across Vermont and southern New Hampshire. Deep snow, temps in 20s, no wind - amazing day! 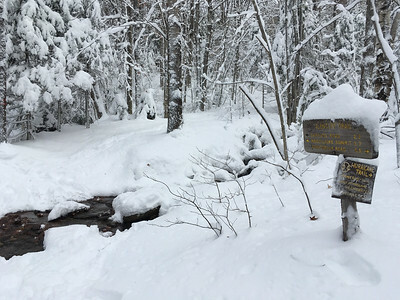 Junction of Hurricane Trail and Glencliff Trail on Mount Moosilauke. Lots of snow for December 1! 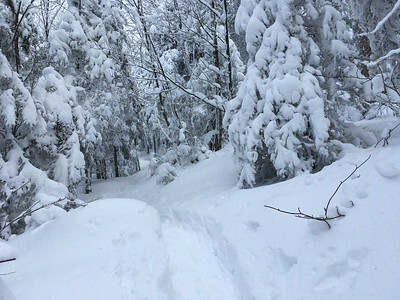 Snowy scenes along the Glencliff Trail, Mount Moosilauke. Lots of snow for December 1! 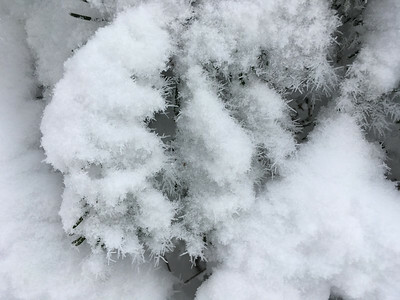 Ice crystals and snow on fir branches, along the Glencliff Trail, Mount Moosilauke. 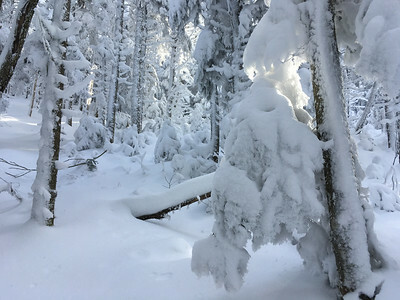 The morning sun shines through snowy branches along the Glencliff Trail, Mount Moosilauke. 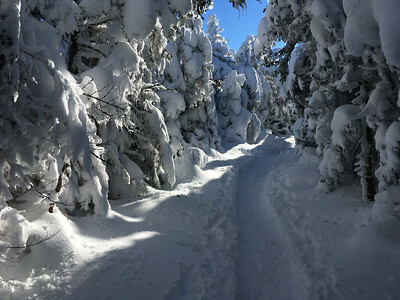 Snowy trail near the "rock garden" on the upper reaches of the Glencliff Trail, Mount Moosilauke. 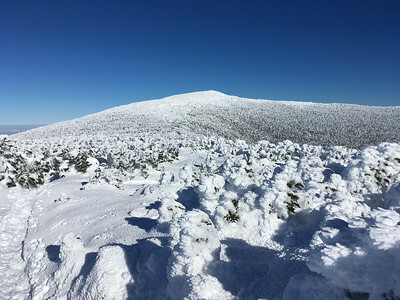 Panorama from the Carriage Road on the ridge between North peak (left) and South peak (right) of Mount Moosilauke. Undercast in the valley. 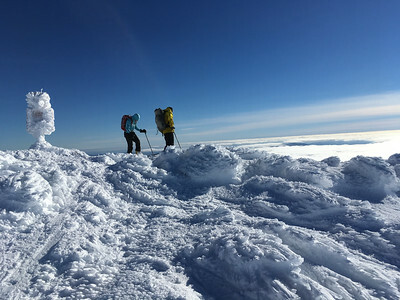 Moosilauke summit on a beautiful sunny day with undercast. 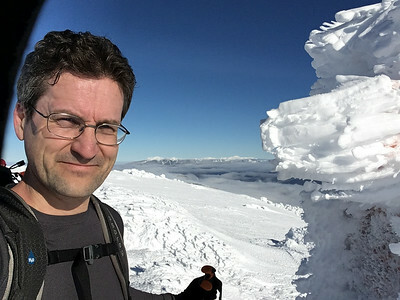 David on the Moosilauke summit on a beautiful sunny day – with Franconia and Presidential Range behind, and the rime-covered summit sign at right. View of Franconia and Presidential Ranges from the Moosilauke summit on a beautiful sunny day with undercast. 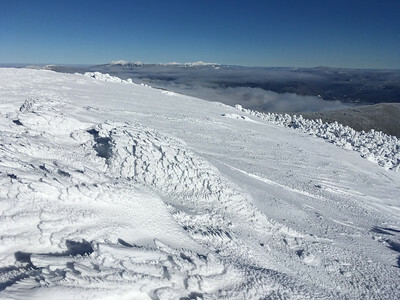 Panorama from the Moosilauke summit looking east and south; a beautiful sunny day with undercast. Panorama from the Moosilauke summit looking south, west, and north; a beautiful sunny day with undercast. 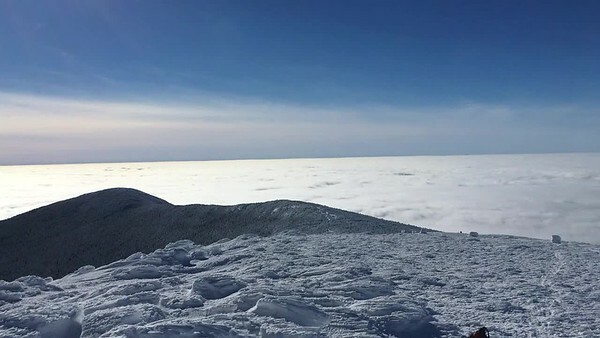 Video panorama from the Moosilauke summit on a beautiful sunny day with undercast. 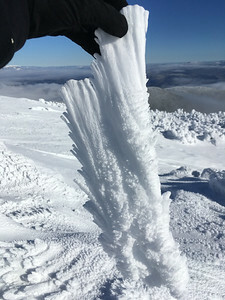 Huge rime deposits on the Moosilauke summit. 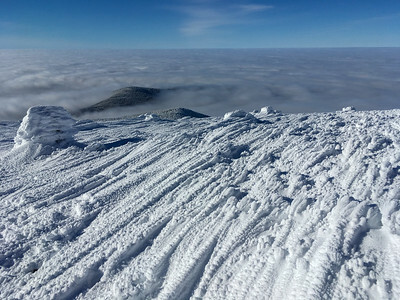 View of Vermont from the Moosilauke summit, on a beautiful sunny day with undercast. Mount Clough (3561') is just peeking out. 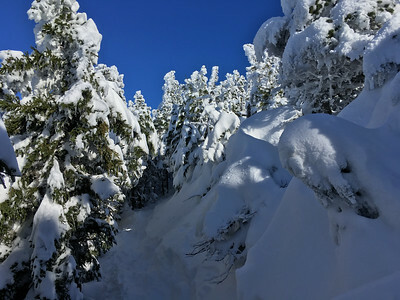 The snowy Carriage Road between N and S peak of Mount Moosilauke.